If you need to find child care, the Early Learning Resource Centers (ELRC) can help. There are many things to take into consideration when making such an important choice as finding a child care provider. Here you will find information on the types of child care providers, the benefits of quality care and what to look for when choosing your child’s early learning program. We use our provider database to match your child care needs with providers in your area. However, you may also conduct a provider search online yourself by visiting the State of Pennsylvania’s COMPASS system here. 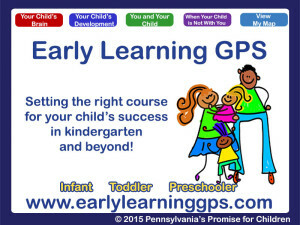 Learn more about Early Learning GPS.